Nonito Donaire shocked us when he took apart Vic Darchinyan. Eight wins later he showed us he was world class when he dissected Fernando Montiel. This Saturday he fights Wilfredo Vazquez Jr and there's one question we need to ask ahead of their match: is Vazquez Jr another Donaire victim? Donaire (27-1) is making his first foray into super bantamweight where he will fight for the vacant WBO title. 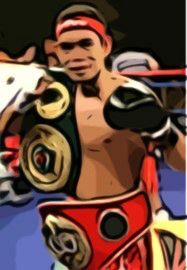 I'm not a fan of the world belts, but Donaire is one guy who is truly a champion. Saturdays fight isn't for The Ring belt - Donaire isn't ranked at super bantamweight and Vazquez Jr is seventh - but it should be a good fight. For the record I have Donaire winning, and once he does I can see him tearing up the division. Who are his rivals there - Rigondeaux, Nishioka, Marquez, Montiel or Ramos? He's beaten Montiel already, Marquez's years are catching up with him and Ramos was scared silly of Rigondeaux. There aren't a lot of meaningful fights for Donaire at super bantamweight. It must be a pit-stop on the way to featherweight, a richer division where Yuriorkis Gamboa, Chris John and Juan Manuel Lopez wait. I'd watch Nonito fight any of them, but will Donaire's power follow him up the divisions? It's a criticism, one of the only ones, that Donaire gets - his tendency to fight smaller guys. Can Donaire mix it with taller, stronger fighters? A stay at super bantamweight is one way to find out, and I can't see it being anything other than a success. Last time out Donaire put in a snoozer with Omar Narvaez. I'm not blaming the Filipino Flash for this; Narvaez stayed in his shell like an oyster and wouldn't come out no matter how hard Nonito knocked. Maybe we're spoiled with Donaire though; we are used to seeing him pick apart his opponents before punching them to the floor. A points win just isn't the same. So this Saturday Nonito will be looking for the knockout. He craves them. He must have dreams about them. And to answer the question of Donaire's power following him through divisions; ten of his last twelve fights have ended by knockout, two of those against Darchinyan and Montiel, who are world class fighters. There is no chance Donaire's power won't follow him up the division and I can't see Vazquez Jr getting away from it. Vazquez Jr (21-1-1) has a lot of power himself, eighteen of his wins coming by knockout, but his defence isn't perfect. In May last year the former WBO champ was beaten in the twelfth by Jorge Arce, another of the division's knockout artists. They had a back-and-forth fight that would have been tough to score for either guy, but in the final round Arce had Vazquez against the ropes, where he unloaded a flurry and forced a stoppage. Since the Arce loss Vazquez's ring activity has amounted to a third round knockout of journeyman Roberto Carlos Levya, a guy who had lost his last five fights. This Saturday I can see Donaire doing to Vazquez what Jorge Arce already did, but he will carry it off with more ease and a hell of a lot more style. Punchbag Blog's pick is an early Donaire KO.